Discussion in 'Technical Chat' started by taco suprme sport, Jan 18, 2007. I am researching the purchase and installation of an electric tailgate lock for my 2005 taco sport double cab. Has anyone installed one and have any recomendations on product ? I bought "pop-lock". I was planning on purchasing the remote controlled lock. the sales rep advised me not to, due to the cost and with the bed cover i had he said don't even waste $70 on it. Ldytaco05, how do you like the "pop-lock"? Read about them and almost bought one. What type of cover do you have ? How does the style of cover affect the lock either manual or electric ? would that lock and unlock with the keyless entry? It's ok I don't have to worry about people opening my tailgate to see what's inside. It's a great security blanket for me. It's so easy to install it took me less than 20mins. I have the extang rt you can easily lift up the velcro. but the good thing about it is you cannot completely fit your entire hand inside so the thief does not have access to my truck bed. Extang product is really reliable did the research ofcourse. if my bed cover was a hard top then i would reconsider installing the electric. I bought that one and am waiting for time to install it. Looks like it should work fine. I sprung for the beefed up actuator another $20 I think. Was here in less than a week. I ordered the DynoLock electric lock as well. I spoke with the owner and bought the beefed up one as well. It should be arriving this week, I plan on installing on Saturday. I will take some pictures and post them for everyonr to see. I really look forward to those pics. I might do this once I get a tonneau cover - money permitting. I will send them over along with some pics of my tanoue cover, it has to be released on the inside to access the bed. We, my son Andrew and I will be doing this project on Sat. From over at CT this concern about lock failure. If you figure out a bypass while installing let us know. Here are the pictures from the installation we did this weekend on my 2005 double cab. After removing the tail gate inner cover, using torx screwdriver.Short wire from kit is run threw tailgate drain hole closest to drivers side. This is tight, we used white lithium grease on the wire insulation to make the wire pull easier. Wire tie the cable along the frame, I attached them to the wire looms running along the frame. The wire ties come with the kit. More wire ties. The kit comes with everything you need. We accessed the wires for the door locks under the sill plate on the drivers side. The technical support from DynoLock was awesome, I called with a question regarding the wire colors to connect to Jim answered all my questions quickly and accurately. This was on a Saturday afternoon !!! 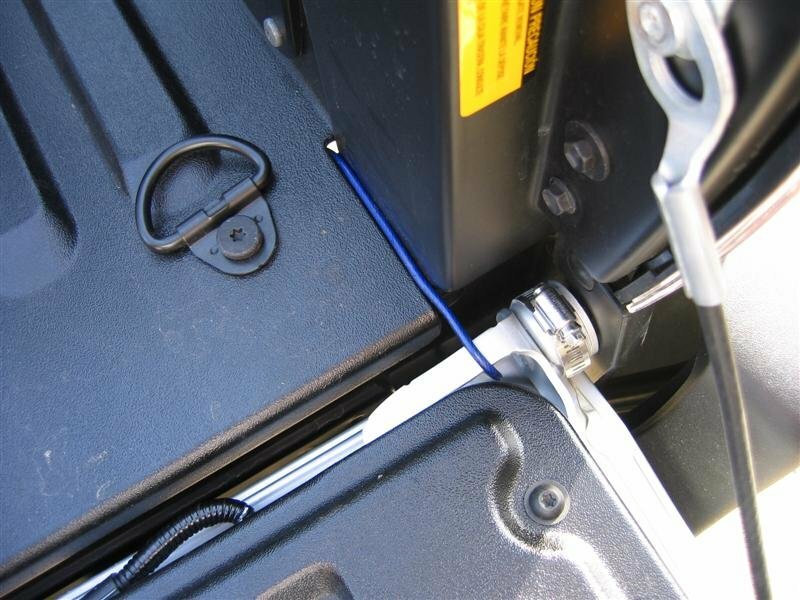 Wire colors blue with pink stripe and blue with black stripe are the lock/unlock on the Tacoma wire harness. Here is the picture of the wires underneath the door sill. These are the only pictures I have of the installtion. Just an update, this system has been installed for 5 months and works very good. It really comes in handy when I am at a job site and have to work away from my taco supreme, I just lock the truck and the rear gate and keep an honest man honest. Also when shopping, I have made puchases that don't fit in the cab, lock them in the tail gate and still stop, shop elseware without the concern of someone walking up, opening the gate and walkinh off with my purchases.